With each album released Swiss folk metal unit ELUVEITIE becomes more popular in markets like North America, more warmly embraced by the folk metal community, and afforded a higher level of recognition for their rich musical tapestry and historically-based (as opposed to strictly Pagan) lyrics. Following a path characterized by a balanced approach to fusing Swedish style melodic death metal with Celtic folk melodies has actually worked as a point of distinction for ELUVEITIE. That is not so much because other acts haven't done something similar, but rather because the band seems to craft its compositions first with the central basis of the song in mind and then with respect to how the different styles fit into it. 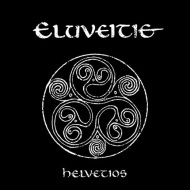 In any case, new album "Helvetios" is the best example thus far of the ELUVEITIE sound both in terms of that balance and the exceptionally well written concept, one that drives with metallic strength and moves like the score to an epic film. As the album title suggests, the storyline on the 17-track disc pertains to the The Helvetians and their role in the Gaulish (or Gallic) War that occurred during the period 58-50 B.C. The extinct Gaulish language (spoken in a region that included what is now Switzerland) has served as inspiration for composer/multi-instrumentalist Chrigel Glanzmann (flutes, whistles, pipes, you name it) since the band's formation and is again highlighted in the tale told on "Helvetios". The majority of the songs balance in fairly even fashion galloping, riff-crunching melodic death with harsh vocals and soaring folk melodies. The mix never fails to stun the senses, even though there is perhaps a modicum of validity to the notion that a touch of redundancy can be detected as one makes his way through the album. Regardless, the results are wildly successful, best exemplified by the title track that follows the opening narration ("Prologue"), the absolutely infectious "Luxtos", and "Neverland". Anna Murphy's (Hurdy Gurdy and all) vocal performance in several places adds a high degree of beauty ("Alesia" and the astonishingly tuneful "A Rose of Epona") and at other times a level of unparalleled intensity ("Meet the Enemy" and "The Siege"). Interestingly enough, the one song that will force you stop whatever you're doing and listen with rapt attentiveness each and every time "Helvetios" is played is the deathless "Scorched Earth". Describing it in simple, perhaps uninformed terms, it is performed a capella (light atmospheric musical accompaniment notwithstanding); sort of sung/chanted in the Gaulish language in a manner that is maddening to try to describe in words. Terms like "soothing," "hypnotic" and "beautiful" just don't do it justice. By the time ELUVEITE finishes performing the final battle sequence on "Uxellodunon", during which Glanzmann declares "This is the final resistance!" with Braveheart fervor, you're left with a racing pulse and a look of awe. You don't listen to the album in a conventional sense since in reality "Helvetios" carries you along with it. A choice in the matter you are not offered. Attesting to the expertness that ELUVEITE displays in the telling of the story through its music and lyrics is the frequency with which visions of ancient battles enter the mind. It is not easy to record a concept album that keeps listener interest for the duration. Yet ELUVEITIE turns in a performance with "Helvetios" that captures that attention with such force that pondering the finer points of concept construction as you listen simply won't happen. You'll be pulled far too deep into it to consider anything other than the story unfolding until the last words of "Epilogue" are spoken and the final notes drift away. "Helvetios" is a white-knuckled folk metal rollercoaster ride and a magical journey, to say the least.